This is a "Bao Ding" brand of Wu Yi Shui Hsien tea. This tea comes packed in a tin and comes with double lids to ensure the tea is well protected from odors and moisture. This tin looks large for a 250g tea but I noticed that the tea does fill up the entire tin. I appreciate the larger tin as the tea leaves are long and quite plump. This tin did a splendid job in ensuring, in my opinion as a buyer, received the tea in very good condition; that is whole leaves. For those chinese teapot brewers whose teapot is single hole with no built in filters, brewing such tea will be a pleasant tea session as the tea leaves will not flow out of the teapot. If you use tiny or broken tea leaves, brewing with a single hole teapot would be very challenging and time consuming. I have met some serious tea drinkers that claimed broken tea leaves tend to be slightly bitter when brewed. I had received a comment a few years ago that my blog was a good site to read about grocery store teas. He or she must be referring to the various tinned Chinese teas I had blogged about these few years. My response would be that if your grocery stores carry these range of tinned Chinese teas, you should be over the moon. To me it is better to drink from whole tea leaves than from tea bags containing tea dust or tea fannings. Some lower quality tea bags may have artificial flavors to enhance your beverage. Chinese tea that were sold in tins were meant for export outside mainland China. Today, I have noticed that Chinese tourists visiting South East Asia are actually buying old teas including such tins, bringing them back to China for their own consumption. Back to this tea. I had purchased this tin a few years ago and this tea had an expiry date sticker on the bottom of the tea - 15 Jan 2012. Such teas have a 'shelf life of about 3 years which meant that this tea is already about 5 years old. The tea is very aromatic. I enjoy the high roasted scent and a nice mellowness and woody notes in the tea. I noticed that new heavy roasted oolong has that sharp taste but this sharpness disappears with storage. Oolongs 'aged' in this sense in that the tea will lose its sharp astringency and becomes mellow and very easy to drink after a time of storage. I would remind my readers that lightly roasted oolongs would not store or 'age' well and it is recommended you drink them quickly to enjoy the 'freshness' of the tea. Refrigeration of these 'green' oolong tea in airtight bags or containers may help in prolonging the freshness of the tea. An enjoyable tea. A single brew can make 6-7 good infusions of Shui Hsien. Inexpensive at less than $10. Do buy a tin if your grocery store has it. T 4 one. That is my feeble attempt to give a short form twist to the title of this blog. I do feel I have an improved sense of humor in my internet chats as my friends do often roll on the floor laughing (rotfl) during our frequent online conversations. Tea for one. The pix above shows a 'gaiwan-like' set. The cover acts as a cup (holding about 100ml) when your tea is ready to be poured out. It is quite a useful tea brewing set. I found out that this 'tea for one' set is made from porcelain but does come in a range of designs that may resemble clay, celadon or a high glazed tea set like the one I had purchased. Notice the nice presentation wooden box that came with this tea set. Making tea is simple with this tea set. It acts as a gaiwan with a easy pour out spout. It does get pretty hot on the fingers so I suggest not to fill hot water to the brim. Very convenient and I could wash this tea set with detergent after use. To me, this is a fancy tea set.....workable and does make a nice conversation piece in the home or office. 2004 South East Asia Puerh Association Commemorative Cake. Yes, it is a long title. 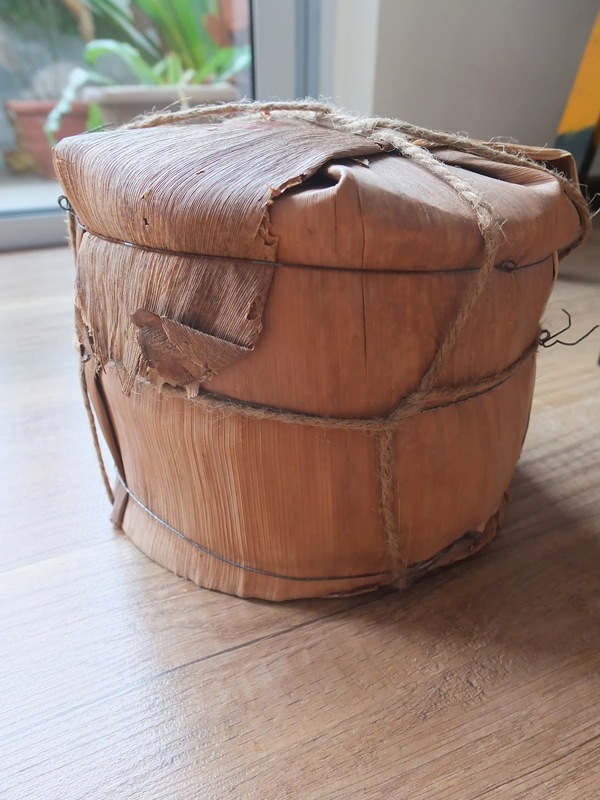 This commemorative raw pu erh cake was produced in 2004 for the 2nd meet-up of members of the South East Asia pu erh club. You will observe from the wrapper that they named this cake 'yi tiao long" (one dragon). When you opened the wrapper, the enclosed leaflet yielded more information about the cake. The cake was made from 1998 tea leaves. These leaves were harvested from wild tea trees in Bulang, Yunnan. Qiu Xiang tea (Malaysia) was the company that was in charge of producing the commemorative cake. Notice the white or yellowish spots on the last pix (click for larger view). Yes, some mold were found on the surface of this cake. Tea drinkers normally brush off the surface of the tea cake (a toothbrush would do nicely) before breaking up the tea cake into pieces for drinking or simply ignore them, which is what I did. I simply broke the tea cake to small pieces and store in my tea caddy. I use 2 flash rinses (hot water in, and immediately pour out) before brewing my tea. In case you are wondering.....I have almost finished a cake. In my few years of traveling, learning and buying tea, I would describe this tea cake as 'wow!' in my opinion. Very impressive. This cake brews very strong and I needed less tea leaves to make a brew. This raw pu erh is highly aromatic; where I could detect nice wood scents with a nice camphor wood aroma which I enjoy very much. The strong complex herbal taste and the very mild sweet finish make drinking this tea very enjoyable. It is very smooth and easy to drink. I do drink this tea faster than other raw pu teas and this tea does leave a nice floral and minty aroma in the mouth. Most importantly, it made me look forward to my next cup or brew of this tea. I am grateful I managed to snagged a tong of these cakes. Hard to find now.